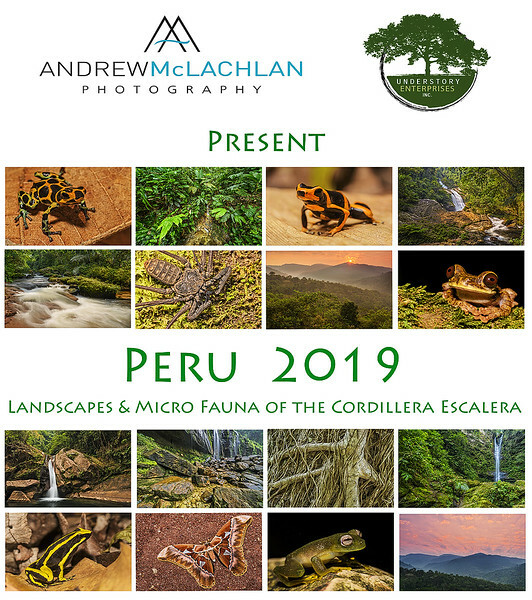 Join Andrew McLachlan and Mark Pepper (Understory Enterprises) for an exclusive photography retreat within the Cordillera Escalera, near Tarapoto, Peru. This location is situated within the foothills of the Andes Mountains, in Amazonian Rainforest. The dates for this event are October 19 – October 26, 2019 (6 ½ days of photography). Maximum number of participants is 6 / 8 depending on participants attending (if two couples are attending the tour we can extend the capacity to 8). The minimum number of participants for this tour is 2. The photo tour fee is $3800.00 US Currency. We need to arrive in Tarapoto, Peru on October 19, 2019 and we will depart for home on October 26, 2019. Depending on everybody’s departure time on October 26, 2019, we may be able to fit in one additional half day of photography. The focus of this photo tour will be landscapes and micro fauna of the Cordillera Escalera. 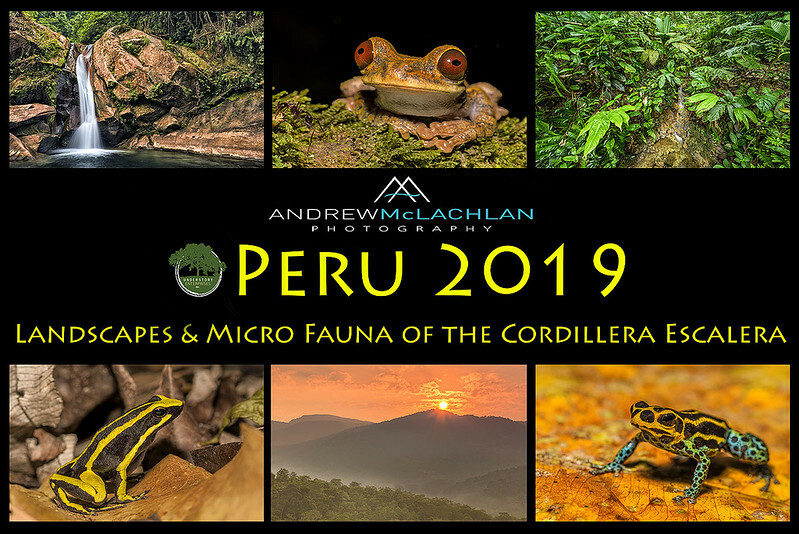 There is nothing quite like watching the sun rise over the foothills of the Andes Mountains as each new day awakens, standing in awe at towering waterfalls, photographing dart frogs in their natural habitat, or venturing out to explore the night life of the Amazon rainforest. One highlight of the night-time excursions will be photographing the endangered Cochran Frog, which has a very limited range in the Cordillera Escalera. We will also be photographing many species of insects endemic to this region. The biodiversity of the Cordillera Escalera leaves no shortage of subjects to photograph. For more info or to register, please contact Andrew by clicking here. We could not ask for a more friendly and knowledgeable guide. Mark Pepper has been exploring this rainforest environment for over 15 years. Mark has even worked with BBC film crews filming in the area. Using his extensive knowledge and keen eye he will locate several species of dart frogs for us to photograph, not to mention some very fascinating insects! Some locations during this tour will require the ability of being able to walk several kilometres over uneven terrain in a humid environment. If you have any concerns regarding this please do not hesitate to inquire for additional information. 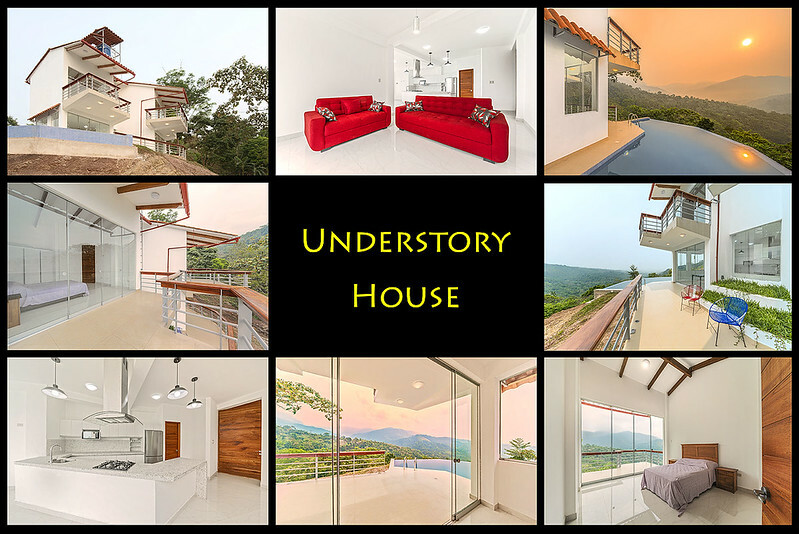 Our accommodations will be at the luxurious Understory House, which is also equipped with a gorgeous infinity pool over-looking the Cordillera Escalera, within the foothills of the Andes Mountains and Amazonian rainforest. There are two rooms with one queen bed each and one room with two sets of adult bunkbeds. Many of our morning sunrise sessions will be conducted on site, as we have an outstanding view of the sun rising over the mountain range. Daily excursions will be determined based on the current weather conditions. Image review sessions will be conducted both in the field via LCD and at the Understory House via laptop computers. Your airfare to and from Tarapoto, Peru (via Lima). Photo Tour Fee: $3800.00 US per person. To secure your spot a non-refundable deposit of $1,200 US is due now. The balance of the fee, $2600.00 US, is due no later than March 31, 2019. A signed Waiver of Liability form must accompany the non-refundable deposit. Waiver of Liability forms will be emailed to those wishing to register. Participants are encouraged to purchase their own medical, travel, and trip cancellation insurance. Full refund less $1200 US non-refundable deposit up to 91 days prior to Photo Tour date. No refunds 90 days prior to the date. If fewer than three folks sign up you will receive a complete refund that will include your non-refundable deposit.